The new center joins over 140 others and, in celebration of its opening, will feature activities and food for children with autism and their families. 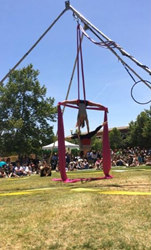 Aerial arts by Suspended Motion will be at CARD Atascadero's summer carnival. Center for Autism and Related Disorders (CARD) today announced that its new Atascadero treatment center will host a summer carnival and open house on June 17 from 11am-4pm. In celebration of expanding its services in the San Luis Obispo County area, the carnival and open house will feature aerial arts from Suspended Motion, as well as food trucks and Paradise Shaved Ice. "We can't wait to meet all of our neighbors in Atascadero at this kick-off event on June 17," said Christina Grimm, CARD operations manager. "We're excited to provide some fun and good food at our summer carnival and make ourselves available as a meaningful resource for the autism community." The new center is located at the corner of Portola and Highway 41/Morro Road with easy access to Highway 101. It has five brand new clinic rooms, a sensory gym, and large open activity space. The center is also conveniently situated near Atascadero Lake Park, Alvord Baseball Field, and the Charles Paddock Zoo, with CARD-sponsored community outings to these locations planned for the future. For more information, please contact Christina Grimm at cg3152(at)centerforautism(dot)com or call (805) 703-2120. The Atascadero center joins over 140 centers that provide services based on the CARD Model developed by Dr. Doreen Granpeesheh, PhD, BCBA-D. Dr. Granpeesheh has dedicated over 30 years to helping individuals with autism fulfill their potential and lead healthy, productive lives. Since its founding in 1990, CARD has helped thousands of individuals affected by autism and their families access the services and supports they need. For specific addresses and contact information forall CARD centers, please visit http://www.centerforautism.com. The Centers for Disease Control and Prevention (CDC) estimates that one in every 68 children in the U.S. is diagnosed with ASD, with one in 42 boys and one in 189 girls diagnosed. These 2014 figures represent a 30 percent increase since 2008. As the prevalence of ASD has increased, services for individuals with ASD have not always kept pace with demand. As a result, families affected by ASD may encounter challenges when trying to access quality treatment. The increase in autism diagnoses and the lack of resources available to families in many communities leave parents struggling to access the services that are crucial to their child’s development. CARD strives to meet the growing need for services by continuously opening new offices throughout the country to provide top-quality ABA therapy across all populations. As a result of its unprecedented growth, CARD is hiring entry-level and experienced clinicians and administrative staff at many of its locations. To explore a rewarding career in the field of autism treatment, visit http://www.centerforautismjobs.com. CARD treats individuals of all ages who are diagnosed with autism spectrum disorder (ASD) at treatment centers around the globe. CARD was founded in 1990 by leading autism expert and clinical psychologist Doreen Granpeesheh, PhD, BCBA-D. CARD treats individuals with ASD using the principles of applied behavior analysis (ABA), which is empirically proven to be the most effective method for treating individuals with ASD and recommended by the American Academy of Pediatrics and the US Surgeon General. For more information, visit http://www.centerforautism.com or call (855) 345-2273.